Johnson has expressed opposition to the GOP tax plan approved by the Senate Finance Committee by arguing that it does not provide enough of a tax reduction for small businesses compared with big corporations. Cutting the tax rate for these businesses, Johnson argues, would boost the economy, thus increasing the amount of revenue collected by the federal government. “It’s not time to cut individual tax rates,” he said. Instead, Johnson insists the tax cuts need to be weighted toward growing the economy, saying that even with the modest economic growth of the past few years, federal revenue has grown $1.2 trillion per year since 2009. Johnson’s claim raised two questions: Would a tax cut on businesses boost the economy and increase federal revenue, and did federal revenue really increase $1.2 trillion per year? Let’s take a look at the math. Johnson’s figures are based on the Treasury Department’s statement for fiscal years 2009 and 2016. The statement provides a snapshot of the federal budget, detailing its revenue and expenditures. In fiscal year 2009, which ran from Oct. 1, 2008, to Sept. 30, 2009, the federal government collected $2.1 trillion in taxes, and eight years later in fiscal year 2016, which ran from Oct. 1, 2015, to Sept. 30, 2016, the government brought in $3.3 trillion. With respect to 2009 and 2016, Johnson spokesman Ben Voelkel said “that’s an increase of $1.21 trillion in the per-annum figure.” And while it’s clear the federal government collected $1.21 trillion more in 2016 than it did in 2009, revenue grew modestly in the intervening years. Starting in 2009 is also misleading because the United States was in the middle of the Great Recession. A year earlier, in 2008, the government brought in $2.5 trillion in revenue. At the start of the recession in December 2007, the unemployment rate was 5 percent; by October 2009 it had reached a peak of 10 percent. Naturally, revenue from individual income taxes declined as many Americans were out of work. When we pointed out to Voelkel that revenue hasn’t increased $1.2 trillion per year, as Johnson suggested, and asked him to clarify Johnson’s argument, he sent over a clip of the senator on CNBC after his appearance on “New Day.” This time around, Johnson dropped “per year” from his talking point and said, “Even with the meager economic growth we’ve had since 2009, revenue has increased to the federal government by $1.2 trillion — with meager economic growth.” However, Voelkel did not respond to an email asking whether Johnson admitted he made an error on CNN. Below are revenue estimates made by the Congressional Budget Office in 2009. You can see that the CBO estimated that in 2016, federal revenue would be $3.9 trillion — $600 billion higher than reality. So a $1.2 trillion increase since 2009 is actually below what the CBO expected in 2009. Johnson makes increasing federal revenue seem as simple as one, two, three: Cut taxes on businesses and the economy grows, boosting revenue as a result, which would close the deficit and bring down the federal debt. But according to a survey of economists by the University of Chicago’s Initiative on Global Markets, 37 out of 38 of economists agree the GOP tax plan would cause the U.S. debt to increase far faster than the economy. (The 38th economist later said he misread the question and actually agrees with the other 37.) In addition, the nonpartisan Tax Policy Center found that even after taking economic growth into consideration, the House GOP tax bill would increase the debt by $1.3 trillion over a decade. Furthermore, revenue is just one aspect of the deficit. The other side of the equation is government spending. The nonpartisan CBO estimates that the federal debt could rise to 89 percent of the gross domestic product, the broadest measure of the economy, by 2027. Currently the debt is 77 percent of GDP. And by 2047 the CBO estimates the debt could reach 150 percent of GDP — the highest level in the nation’s history. The debt increase is primarily due to growth in federal spending outpacing growth in federal revenue. So even if changes to the tax plan grow the economy, in order to reduce deficits, and the debt, federal spending has to be in line with that increased growth. In his opposition to the GOP tax plan, Johnson makes increasing federal revenue sound as easy as cutting taxes to grow the economy, thereby boosting federal revenue. But it’s an oversimplified equation. Deficits reflect federal spending as well as federal revenue. And changes to any side of the equation can have a major impact on the deficit. More importantly, many economists agree, the GOP tax plan would grow the deficit much more quickly than it would grow the economy. Moreover, to support his case, Johnson overstates the amount of revenue collected over the past several years. 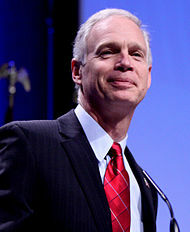 Johnson claimed on CNN that federal revenue increased $1.2 trillion per year since 2009 with modest economic growth; in a subsequent interview, he dropped the “per year.” But in any case, he’s using cherry-picked numbers, as his base year is 2009, when the United States was in the midst of a devastating recession. 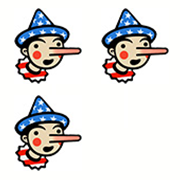 Johnson receives Three Pinocchios for his fuzzy math. during an appearance on "New Day"